You can learn a lot about an animal by its scientific name; clues on how the animal behaves, relationship to other animals, or where the species is found. The Blue Crab’s scientific name, Callinectes sapidus, tells a lot about the creature. Callinectes means beautiful swimmer and sapidus means tasty; so if we put those two words together the scientific name for the Blue Crab means “a beautiful swimmer that tastes good”. And ain’t that the truth! Rather than give out some tasty recipes I would like to tell a little about this attractive crustacean. 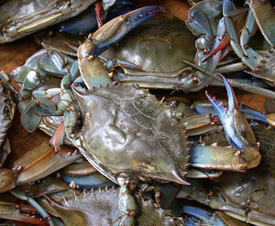 The Blue Crab belongs to the family of Portunidae; crabs that have a pair of swimming legs. They are closely related to the shrimp, lobster and crayfish. They are also one of the dominant species found in the benthic (bottom dwelling) estuary habitat where they feed on anything from vegetation, shellfish, detritus, as well as their own kind. Deciphering a male from a female is pretty straightforward; males have an inverted “T” found on their apron (location of reproductive organs) while the female has a more rounded, broader apron and red tips found on their claws. The females are able to produce 750,000 to 8 million eggs, a large orange egg mass found in the apron, which darkens through their 2 week spawning cycle. The reproductive months range from May to September, with peaks in June and July. With the abundance of eggs, it would seem that their population would be through the roof, but with constant harvesting their average lifespan ranges from 1 to 2 years. If you do choose to harvest Blue Crabs, keep in mind that the legal size is 5 inches wide, and if possible, leave the females be in order to allow another generation to swim freely. Before heading out to your local seafood shack, venture over to the Lloyd Center to admire the beauty of the Blue Crab!